16 Great CANADIAN COUNTRY SONGS x2! I'm pleased to report that of all my posts here at the Attic, some of the best response has been garnered by my own transfers of vintage Canadian Country. This pleases me because so little of this material has circulated otherwise, especially in the digital era. I feel that by transferring and encoding clean versions of these rare recordings I am hopefully perpetrating them for posterity. It is in the aforementioned spirit that I present two great collections of such material from the great Rodeo/Banff catalogue. 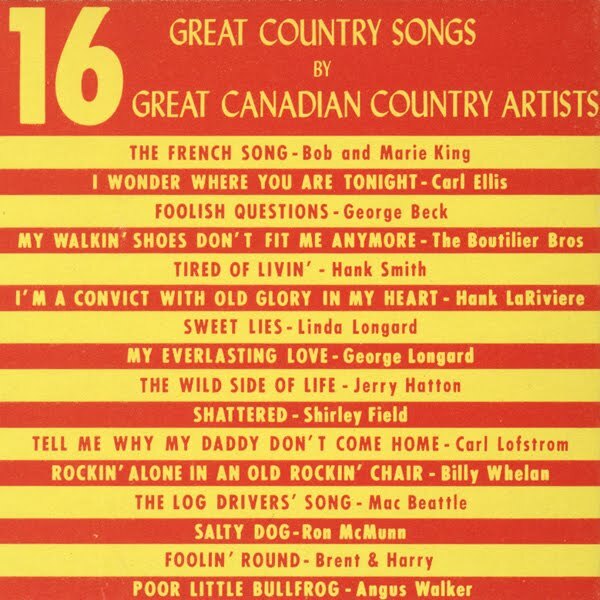 Two different albums titled "16 Great Country Songs by 16 Great Canadian Country Artists" were released on the Banff label in 1963 (RBS 1125) and 1964 (RBS 1190). 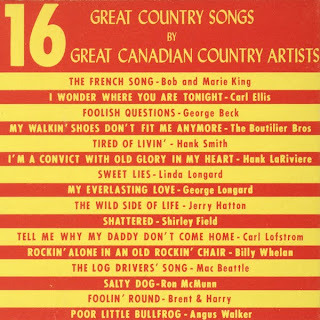 Banff had an ongoing "16 Great" series with titles representing the various genres in which the label specialized such as fiddle, folk songs, country, etc. The collections were presumably meant to promote the label's artists to buyers who would perhaps pick up on a new favourite and purchase more of their recordings. Today the collections make great samplers by which collectors can familiarize themselves with artists whose original LPs and singles are scarce and out of circulation. The present transfers are sourced from a pair of rare cassettes issued in the early 1980's on a series of tapes called "Canadian Cavalcade". Rodeo used the "Canadian Cavalcade" label on and off from the late 60's right through to the company's eventual demise. The tapes provide great fidelity on these rare, classic tracks. Luke Simmons & The Blue Mountain Boys, "Wabash Cannonball" - A performance of one of the most ubiquitous Country songs by Vancouver born Luke Simmons, who for a time had a significant career in New Zealand. The track was first featured on the late 50's Rodeo LP "Canadians Make Good Abroad" (RLP 53). Donn Reynolds, "No One Will Ever Know" - This song, first popularized by Roy Acuff in the 40's, was a 1962 chart hit in Canada for champion yodeller Donn Reynolds. It was released as a single and also included on the Winnipegger's Banff LP "The Wild One". Bob King, "The Little Shirt My Mother Made For Me" - An old novelty song popularized by Wilf Carter is rendered here by the Ottawa Valley legend, Bob King. The track is taken from his album "Just Me & My Old Guitar, Bob King Sings Songs That Tell A Story" (Banff RBS 1103). The album can be downloaded here. Joyce Smith, "Jambalaya" - Joyce Smith was born in Lethbridge, Alberta. She toured with the Rodgers Brothers band for many years, and in the early 60's was the first to record "Leavin' On Your Mind", a song associated with the late Patsy Cline. Stu Phillips, "Streets Of Laredo" - Calgary's Stu Phillips was a broadcasting and recording personality in Western Canada before becoming a member of the Grand Ole Opry in 1967. He performs in a gentle folk style reminiscent of the late Jim Reeves as is evidenced by his rendition of this western classic. Angus Walker, "If Teardrops Were Pennies" - Angus Walker was a Nova Scotia artist who was an early Canadian practitioner of the emerging Bluegrass style. Here he turns in a performance of a tune made famous by Carl Smith. 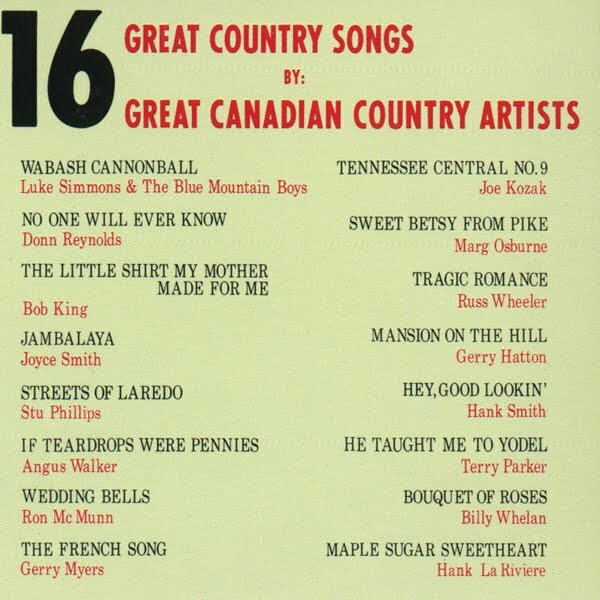 Ron McMunn, "Wedding Bells" - The late Ron McMunn was a legendary exponent of Old-Time Country Music in the Ottawa Valley, performing over CJET, Smith's Falls and making many recordings for Rodeo in his prime. Gerry Myers, "The French Song" - First recorded in 1945 by Annette and Carmen Richer as "Bonjour mon soleil", the tune was adapted by Moncton, New Brunswick broadcasting legends Gerry Myers and The Bunkhouse Boys whose late 50's recording was a regional favourite. In 1964 Lucille Starr had an international pop hit based on Myers' version. Joe Kozak, "Tennessee Central No. 9" - Edmonton's Joe Kozak with a track from the LP "Canada Salutes Nashville, Tennessee" on which he was accompanied by the Rodgers Brothers Band (Banff RBS 1102). Marg Osburne, "Sweet Betsy From Pike" - Don Messer's legendary vocalist Marg Osburne with a track taken from the 1959 LP "Marg Osburne Celebrates Rodeo's 100th Anniversary Album with a Century of Folk Songs" (Rodeo RLP 100). The LP was reissued in the later sixties as "The Golden Era of Marg Osburne" (Banff SBS 5329). Russ Wheeler, "Tragic Romance" - This 1945 hit for Cowboy Copas was the title track from Wheeler's 1964 debut album on Banff. For a fantastic bio of Russ Wheeler, click here. Gerry Hatton, "Mansion On The Hill" - A track from Hatton's (his first name is usually spelled "Jerry") first LP "The Texas Beat with Jerry Hatton" (Banff RBS 1122). Check out Jerry & Debbie Hatton's website here. Hank Smith, "Hey, Good Lookin'" - German born Hank Smith (1934-2002) moved to Canada in 1957 to pursue a career as a Country singer. Here he sings a Hank Williams favourite. Terry Parker, "He Taught Me To Yodel" - "Miss" Terry Parker began recording for Rodeo/Banff in 1961 and this track was on her debut album as well as being issued as her first single. Miss Parker was apparently a fixture on the nightclub circuit in Ontario and Quebec, and is featured on a rare soundtrack recording from an early 60's episode of CJSS-TV Cornwall's "OK Jamboree" previously posted here. Billy Whelan, "Bouquet Of Roses" - Nova Scotian Bill Whelan was a veteran of Maritime radio, having performed on stations such as CJCH Halifax, CKBW Bridgewater, and CKCW Moncton, some of his broadcasts being picked up for national transmission via the CBC network. He can be viewed singing "From A Jack To A King" on a 1963 episode of "Don Messer's Jubilee" here at 5:03. Hank LaRiviere, "Maple Sugar Sweetheart" - The original and definitive recording of LaRiviere's vocal adaptation of Ward Allen's 1956 hit fiddle solo "Maple Sugar". Ward plays fiddle on the present recording. Henri "Hank" LaRiviere performed later in his career as Hank Rivers. A bit of his amazing story can be read here. Ron McMunn, "Salty Dog" - Ottawa Valley legend Ron McMunn performs this Bluegrass standard. Carl Ellis, "I Wonder Where You Are Tonight" - A fine rendition of a Country classic from the pen of Johnny Bond. Carl Ellis had an LP on the Banff label titled "The Country Sound of Carl Ellis". I have been unable to uncover any additional information about Ellis, so if anyone has anything to add, please comment. George Beck, "Foolish Questions" - Maritime country legend George Beck performs a Country novelty tune. Beck and his Maritime Playboys had a popular TV Show on CHAU-TV in Chaleur Bay, Quebec when he recorded this tune for his Rodeo LP "George Beck's Jamboree" in the late 50's. He also made a classic album around the same time with a young Fred McKenna. McKenna later recorded this tune himself for Arc. The Boutilier Bros, "My Walkin' Shoes Don't Fit Me Anymore" - A pioneering Canadian Bluegrass act, Nova Scotia's Boutilier Brothers made several albums for Banff in the early 60's. Here they perform a Jimmy Martin classic. Hank Smith, "Tired Of Livin'" - A track from the LP "Hank Smith And The Fabulous Rodgers Brothers" (Banff RBS 1161). Hank LaRiviere, "I'm A Convict With Old Glory In My Heart" - This track is from Hank's 1964 LP "A Salute to Gallant Men" (Banff RBS 1143). Linda Longard, "Sweet Lies" - A Marty Robbins classic performed by Linda Longard. I assume Linda was either the wife or sister of George Longard (see below). George Longard, "My Everlasting Love" - A veteran of the Halifax country scene, Longard is still performing. His website can be viewed here. Jerry Hatton, "The Wild Side Of Life" - From Jerry's second album, "Sittin' and Thinkin'" (Banff RBS 1187). Shirley Field, "Shattered" - This 1963 recording was the lead track on Field's 1963 LP "Two Sides of Shirley Field" (Banff RBS 1186) and was released as a single as well (Rodeo 3177). Shirley Field is an accomplished yodeller and is still an active performer today. Her website is here. Carl Lofstrom, "Tell Me Why My Daddy Don't Come Home" - Carl (sometimes spelled "Karl") Lofstrom of Fredericton, New Brunswick had a style reminiscent of both of Canada's first true country stars, Hank Snow and Wilf Carter. A short bio of Lofstrom, "The Yodelling Night Herder", can be read here. Billy Whelan, "Rockin' Alone In An Old Rockin' Chair" - Whelan performs a classic "mother" song that was composed by Bob Miller in the early 30's. Mac Beattie, "The Log Drivers' Song" - "The Log Driver's Song" was Mac Beattie and the Ottawa Valley Melodiers' first recording in the 1950's and it launched the group on an extraordinary recording career on the London, Rodeo, and Banff labels. Most of the groups original LPs have been featured at the Attic (click here) and the great Steve Fruitman of CIUT has a great Mac Beattie tribute page here. Bob and Marie King, "The French Song" - Yet another version of this enduring standard, performed by Bob King and his wife, Marie. Marie's French singing on her English speaking husband's shows attracted so much attention that he made her the centre of their act. Rodeo started the Caprise label to release her and other francophone artist's recorings. Brent & Harry, "Foolin' Round" - Nova Scotian neighbours Brent Williams and Harry Cromwell were pioneers in many ways. The were among the first Canadians of African descent to perform country music commercially, and also some of the first to perform Bluegrass. Here they're on the country side, singing a Buck Owens classic. Brent Williams is still a very active performer, check out his website here. Angus Walker, "Poor Little Bullfrog" - Another Bluegrass number by Angus Walker, composed and first recorded by Jimmy Martin.